The Pompidou Centre in Paris is instantly recognisable. It is celebrating its 40th anniversary. The iconic building with its radical architecture was designed by Renzo Piano and Richard Rogers. It was opened to the public on January 311977 and has sparked decades of controversy since it was built in the heart of one of the French capital’s oldest neighbourhoods. Architect Bernard Plattner is a partner at the ‘Renzo Piano Building Workshop’. “One of the fundamentals of the spirit at the time, and of Renzo Piano and Richard Rogers, is to open this building onto the outside and excite the curiosity of passers-by, of people who don’t usually want or feel like walking into a museum,” he said. In the past it has been mocked for its exposed pipes while some critics said it looked like a building site. But the modernist centre has now settled into it surroundings in the Beaubourg area of the French capital. “The creation of the Pompidou Centre represents a complete break with the Paris scenery, and firstly with regards to the architecture. It was like a spaceship landing in the middle of the city, in the historical and oldest neighbourhood. We’d never seen architecture like this. ‘But it was also a break with the way art was put on display. In France, we were stuck with a model based on old museums, designed as sanctuaries, with its doors and its front steps and a succession of rooms bathed in quiet obscurity. Here, we created something, which was this open forum – you can see it behind me – in which you could walk straight in as if the city just didn’t stop at the door, as if we’d created a city inside the city,” opined Serge Lasvignes, President of the Georges Pompidou National Centre for Arts and Culture. And in the “city of culture”, artists reign. Spanish painter Salvador Dali’s 1979 and 2012 retrospectives attracted record number of visitors almost 900,000 for the first and 790.000 for the second. They are the most viewed shows in the 40 year history of the centre. The quality of the shows has made it one of Paris’ most popular sites. “ I think it’s symbolic that in Paris, in a city where we have a hard time innovating and creating things that are different from the classic Haussmann building, we had the courage to make this very different museum, in the heart of the city and that it was so widely accepted,” said one Parisian. 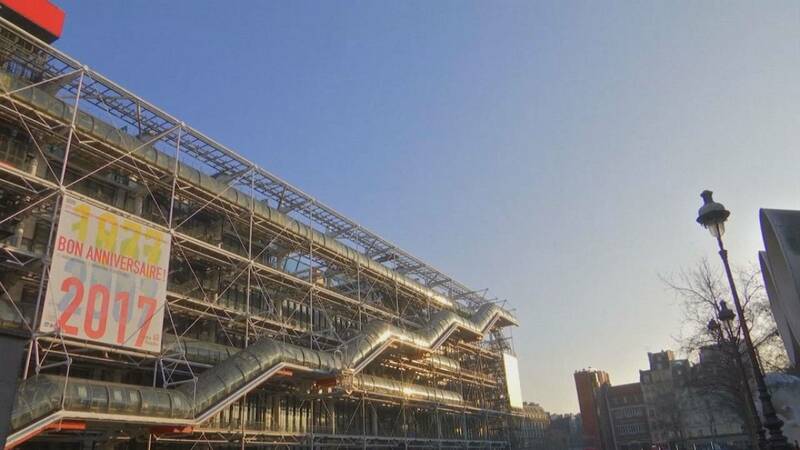 More than three million people visited the Pompidou Centre in 2016. Quite a success for a museum that doesn’t quite look like one.